Friendship Friday - My Grandpa! Hello, and welcome to this week’s edition of Friendship Friday. Today I have another one of the special people in my life — my Grandpa! Grandpa and I have always been buddies — for as long as I can remember. Grandpa worked at United Airlines for 41 years, stepping down in 1978. Gramps was assigned to different airports by United as their Chief Maintenance Manager (or something like that) — so he and Grandma and Mom and Aunt Bette and Uncle Roger were always travelling to different states. My Grandpa was assigned to work at the United Airlines Hangar for the then unopened Dulles International Airport in Northern Virginia. It was Grandpa’s job to make sure that the United hangar was ready for business when the airport opened up. It was while Grandpa and all the family were there that my Mom and Dad met and got married! When I was born, my Grandma and Grandpa were living in Buffalo, NY, where Grandpa was in charge of the hangar at the airport there. I don’t remember Buffalo much because I was young, but my Grandma always told the story that I would be off somewhere, and they would find me playing with the toads that I would find over by the cellar windows outside. After Buffalo, my Grandpa was stationed at the last airport he worked at before retirement — Newark, located in Newark, NJ. My Grandparents lived in Berkeley Heights, NJ, and I remember our trips north to visit Grandma and Grandpa there. It was then that Grandpa and I started forging our bond. We would go to the airport and look at the planes land from the observation deck — back in the days when you could go to the airport, park, and watch planes all day if you wanted to! Grandpa had so much knowledge about the airplanes. He would look at one and say — there’s a DC-10, or a 727, or a 737, or, of course, a 747. It was great to see him in action, and I learned a few things about planes back then. In October 1978, I believe it was, Grandpa retired, and Grandma and he began their last move — to Port Richey, Florida! It was there that my fun with Grandma and Grandpa would begin in earnest! In 1979 My Mom, sister Robin, and I flew down to visit Grandma and Grandpa. Dad was a self-employed cabinetmaker, so unfortunately he didn’t have much time off, so he stayed behind. As you pass under the railroad tracks, somehow, Walt Disney has magically taken you out of the here and now, and transported you back to a different time, a different place, where small town Americana is alive and well; where Main Street isn’t just the name of a street, but it is a place to hang out with your friends, where you can eat, shop, and even catch a movie. As you gaze at all of the incredible buildings, you are taken aback at how long Main Street, U.S.A. is. It seems like it goes on forever! But you peer at the end of the street, and what do you see? This magical castle waiting for you, beckoning you to take a look at it, daring you to even go inside of it! You have heard about that castle, how it is Cinderella Castle, and belongs to her. You have read about how you can walk all the way through the castle, and come out in Fantasyland. You have even heard that you can even have a meal at Cinderella’s Royal Table — but that memory is for another trip. After that first summer, my Grandma and Grandpa started asking if I wanted to visit with them during the summer months when school was out. Hello! Of course I said yes! I remember the first time I drove down with them, and I had been visiting for a while when my Grandpa said, “Mickey, when do you think you want to go back home?” I thought for a while, then I said something to the affect that school started September 5th, so I guess I needed to be home a couple of days before so I could get school clothes. I think my Grandpa thought I was homesick, but how could I be? I had my buddy with me! And did I mention it was Florida?! Grandpa and I did so many things together. We took care of the neighbor’s pool together — so we could swim in it. We learned how to swim together. We would go to the library and check out a book on a particular swimming stroke, and we would read a page by the pool, then go check it out in the water to see how it worked. During that summer, we learned all the major swimming strokes! We would go to the beach together while Grandma was playing Bridge with the ladies. My Grandpa was — and is — an inspiration to me to this day. He and Grandma lived through so many things — the Great Depression, wars, the Cold War, uncertainty, illness — yet they never wavered from who they were, and what they believed. That is a lesson for all of us in this day and age. My Mom is the oldest of my Grandma and Grandpa’s three children. When she was one or two years old, she got bitten by a mosquito and became extremely ill. My Mom had to learn how to talk again, and she had to learn how to walk again. Through all of that, my Grandma and Grandpa were there, helping her, guiding her along as she learned the things she needed to learn again. My Grandpa would work with her when he got home from work — all the patience in the world. Infinitely more patience then I have, that’s for sure. We are all miracles, but I think some of us are a little more of a miracle then others. When I think back on how sick my Mom was as a baby, just the fact that Robin and I were even able to come into this world is a testament to God’s Power and Strength — and his Mercy. Carry that forward, and it is obvious to me that Sophie is a miracle of her own — so tiny, such a little baby, but now an 11 year old. None of us are perfect, that is certain, but the blessings we have — in my mind, they outweigh the problems we have so much, if we just choose to see them. At the end, my Grandpa passed away the way I think we all would like to pass on — at home, in his bed, with his family by his side, singing him Happy Birthday one last time. 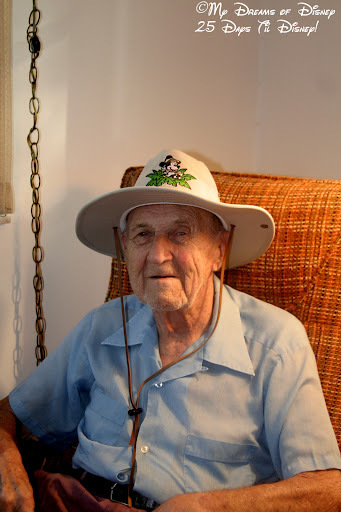 My Grandpa was born on September 4, 1913, and he passed away on September 4, 2011, and the tender age of 98. Gone…but never, EVER, forgotten. I love you Grandpa. My friend Heidi is the inspiration behind the Friendship Friday series for me! She even lets me link up with her site each week! Click on the image below to see what friend she is highlighting today, and thanks for stopping by! Happy Anniversary, Grandma and Grandpa! Friendship Friday: Meet my Mom! Friendship Friday: Happy Birthday Jim! I’m starting my day off with tears now, Mike! What a wonderful tribute to your Grandpa. He sounds like an amazing man. The part that really spoke to my heart the most was when you mentioned learning to swim together and checking swimming books out from the library. What a special memory! It makes me want to take more time for my own kids. Time passes so very quickly. Thanks, Heidi! He was a special man in my life, and I was blessed because of him. Previous Post: Disney In Pictures Theme: Wishes!